The 30.4 metre motor yacht Breakaway, listed for sale by Kurt Bosshardt at Denison Yachting, has had a $300,000 price reduction. Built by US builder Broward entirely in aluminium and launched in 1997, Breakaway features a full-width saloon with a dining area. This semi-displacement motor yacht can accommodate up to eight guests in four cabins, comprising a master suite, VIP suite and two twins, all with entertainment centres, LG television screens and en suite bathroom facilities. 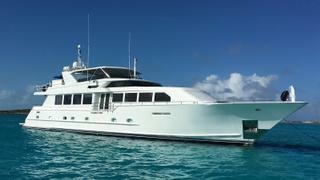 A further three cabins sleep five crewmembers aboard this yacht for sale. Her interior by Robin Rose and Marc Michaels is finished in birds-eye maple joinery along with upgraded marble and mosaic tiled bathrooms throughout. Breakaway benefitted from refits in 2004 and 2011, and in 2017 completed a major overhaul with several upgrades including new air conditioning, a new watermaker, new audio/visual equipment, and a new tender on a hydraulic lift aft. Powered by twin 1,350hp Caterpillar engines, she has a cruising speed of at 14 knots with an 18 knot top speed. She also has twin 40KW Northern Light generators and Naiad stabilisers. Currently lying in the Bahamas, Breakaway is now asking $1,695,000.